What Are the Best Tips for Teaching High School Mathematics? Keeping students focused in the classroom is one of the challenges of teaching. Teaching high school mathematics can be a rewarding experience, but it can also be extremely stressful if the teacher does not do a fair amount of planning before the school year begins. High school students go through monumental changes, so keeping them focused and productive is one of the most difficult parts of teaching. Setting clear guidelines for behavior and performance at the beginning of the school year will help the teacher maintain control of the classroom and improve student performance. Teaching high school mathematics will also require the teacher to be prepared by knowing the material thoroughly. this may mean taking a refresher course or reviewing basic concepts. Mathematical concepts can be difficult for students to comprehend, so patience and repetition will be necessary when teaching high school mathematics. It may help to do a pre-assessment, which is a test or examination given early on in the school year or semester to gauge a student's current knowledge of concepts. This assessment will allow the teacher to make adjustments to lesson plans that will address learners of various skill levels. It will be important for the teacher to address students with special needs as well, and this pre-assessment can be one tool toward addressing those needs when teaching high school mathematics. Discipline in a high school classroom can be quite difficult to maintain. The teacher will need to outline specific rules and expectations early on in the school year and enforce those rules consistently throughout the year. If the teacher decides to make a list or rules, it helps to post those rules clearly in the classroom. Try to keep the rule list brief, and positive: instead of saying, "No talking during class," say instead, "Quiet conversations may be allowed after a lesson is complete if all student work is handed in." This gives the students a clearly defined goal for achieving a privilege. Consistency and smooth transitions between lessons is vital to successfully teaching high school mathematics. The teacher should make sure concepts tie in with one another from one lesson to the next. It may be necessary to review previous topics before moving on to new topics, and it is always helpful to explain to students how the previous concept matters in relation to the new concepts. Writing lesson goals on the board is a practical way to give students an understanding of what they are about to learn. Clearly post these goals on the board and leave them there throughout the duration of the lesson or unit. 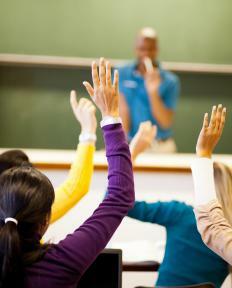 How do I Choose the Best Teaching Colleges? What are the Different Types of High School Classes? How do I Choose the Best Mathematics Curriculum?